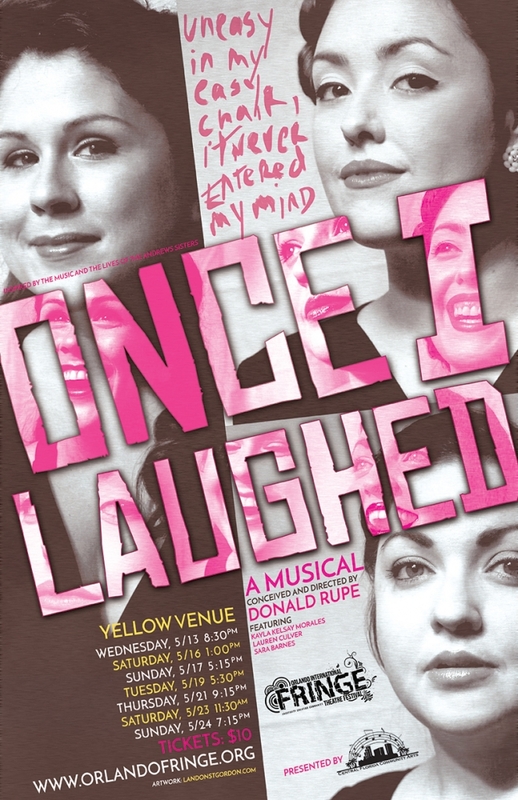 Central Florida Community Arts is excited to make its debut at the Orlando International Fringe Festival with Once I Laughed, a musical showcasing and inspired by the music and the lives of the Andrews Sisters. The Andrews Sisters, famous for their tight 3-part harmonies and tireless commitment to touring for the American military during World War II, were, in their time, the most famous ‘girl group’ in music history. By the 1970s, the group had sold over 75 million records, and hits like “Boogie Woogie Bugle Boy” had solidified the sisters in the minds of Americans forever. Patrons of Once I Laughed can expect to hear many of the Andrews Sisters’ classics threaded into true stories from their personal lives. LaVerne, Patty and Maxene’s tight-knit harmonies were less consistent in their personal lives and they were among the first celebrities to be the talk of the tabloids.The sisters fought mercilessly and experienced years of ups-and-downs in life; love, money and eventually illness and death painted a very different picture from what many people acquainted with these ladies who, at one time, were recognized worldwide on a first-name basis. Conceived and directed by Donald Rupe, the cast boasts some incredible singer-actresses as the sisters: Sara Catherine Barnes is LaVerne Andrews, Lauren Culver is Patty Andrews, and Kayla Kelsay-Morales is Maxene Andrews. The show’s ensemble includes Blake Aburn, Rockie Kobrin, and others, and Heather Langs will be at the piano. This show contains mild adult language. Ticket sales are through Orlando International Fringe Festival. Tickets are $10 and patrons must have a Fringe button ($8, purchasable at select locations at Fringe) to enter. Tickets are non-refundable and, once purchased, cannot be switched from one performance to another. If you are new to Fringe please view How to Fringe.